An updated design fixes some flaws in last year’s model, but the real selling point is still its great value. When we reviewed HP’s 17-inch Omen gaming laptop last year, we found it to be a little boring, but packed with a ton of powerful hardware at a very attractive price. HP’s back this year with a new Omen design, but that general description still holds true. 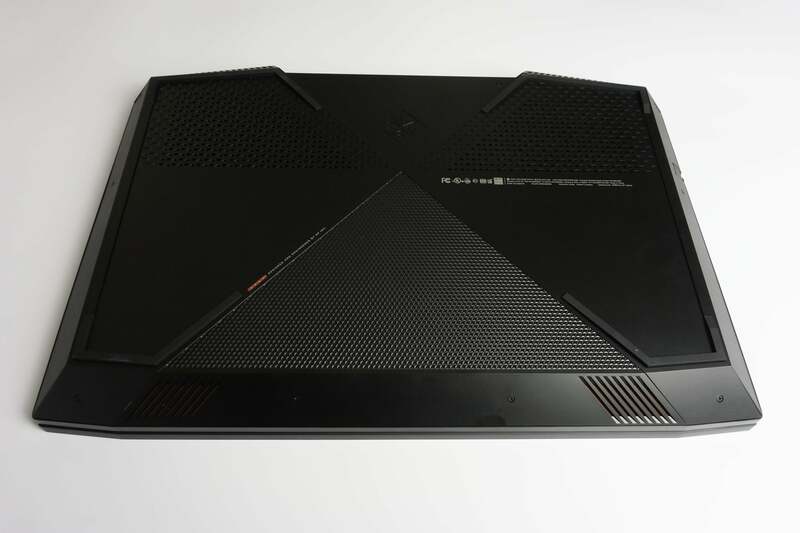 This is not the fanciest high-end gaming laptop we’ve seen. Nor is it the absolute fastest. Nonetheless, other brands charge hundreds more for the same basic specs, often with little or no performance advantage. I hesitate to call the $2,000+ Omen 17 a “bargain,” but you definitely get a lot of bang for your buck. 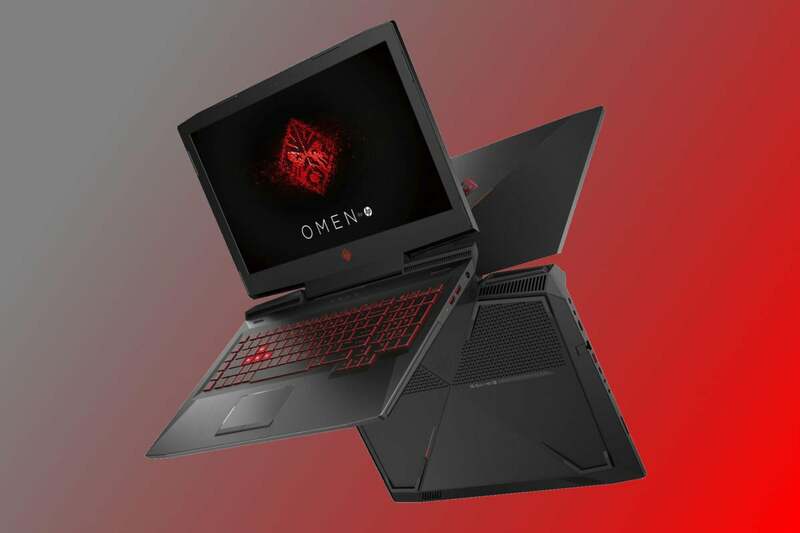 HP has improved upon the pedestrian design of last year's Omen with a look that brings to mind the shape of a modern Lamborghini. 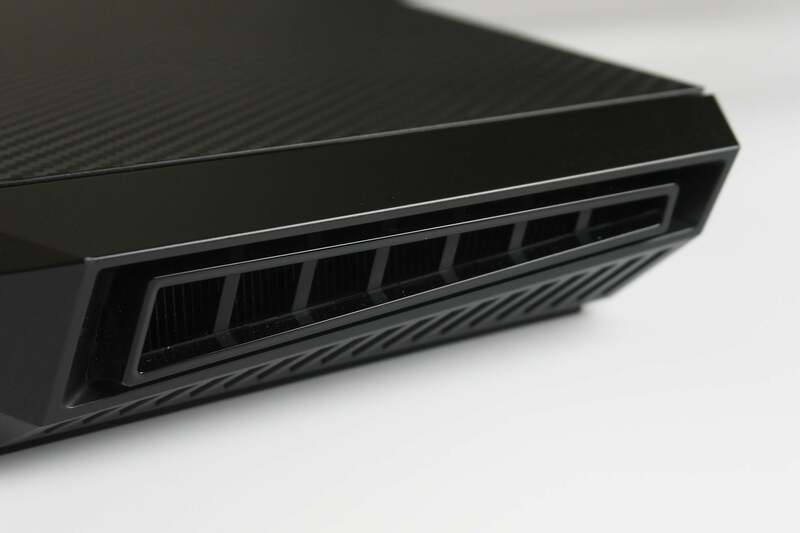 It’s all angled air vents and carbon fiber-like texturing (no, it’s not actually carbon fiber). The new Omen is still very plastic, but it at least looks kind of like a carbon-fiber exotic car. The new design allows for better cooling and increases maximum potential airflow by about 20 percent, but it doesn’t come free. At 33mm, it's still thinner than a lot of other 17-inch gaming laptops, but the base weight without the power brick creeps up to 8 pounds, 3 ounces—a full pound heavier than last year’s version. No, it’s not a Lamborghini Aventador, but the angled vents try to project that sort of image. The new Omen 17 is packed with ports, most of them on the left. You get Mini DisplayPort, HDMI, ethernet, USB 3.1 (Gen 1) Type A, USB 3.1 (Gen 1) Type C, headset, microphone, and an SD card reader. Good news! That Type-C port also supports Thunderbolt 3, a feature sorely missing from the 2016 model. 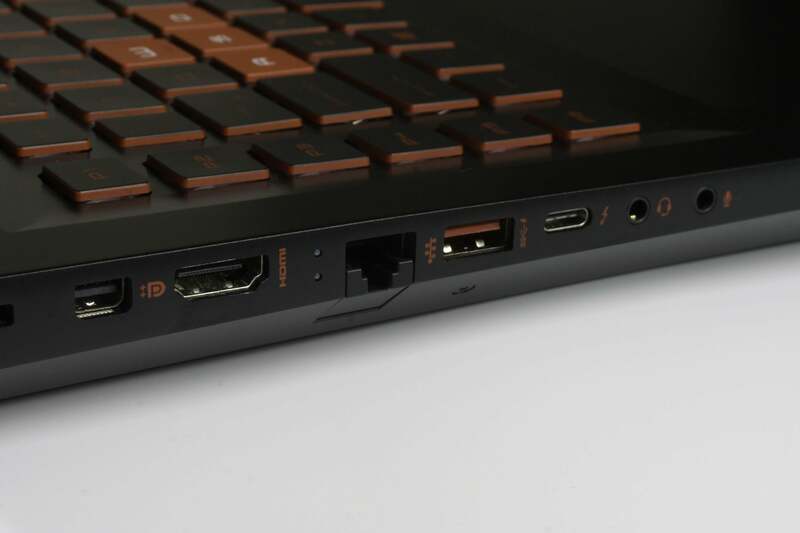 HP finally added a Type-C connector with Thunderbolt 3 support. Not enough USB for you? The right side has another pair of Type-A connectors, supporting USB 3.1 (Gen 1), along with the power plug (a standard barrel connector). 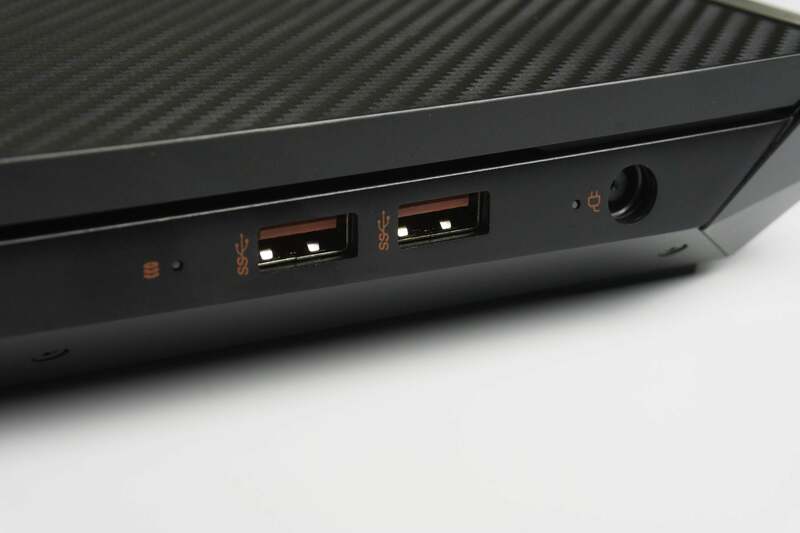 Without an abundance of USB ports, how are you going to plug in that VR rig? We made special note of the 2016 Omen’s poor serviceability relative to other big gaming laptops. There was only one small door giving you access to the RAM, and any other upgrades (like a new hard drive) would require more intensive disassembly. HP has moved backward in the 2017 design. You can’t get inside at all without removing at least 10 screws and pulling off the whole bottom. If you want to make upgrades, you’re going to have to remove a bunch of screws. The full-size keyboard is the same as last year’s, complete with red LED backlighting, a full ten-key keypad, and a row of macro keys on the left. The touchpad hasn’t changed, either: It works well enough, but falls far short of the best Windows touchpads like those on the Surface Book or Surface Laptop. You can pick any keyboard color you want, as long as it’s red. The 17-inch Omen we reviewed last year was notable for giving you lots of high-end hardware at a very reasonable price. That still holds true, and it’s still the greatest strength of HP's gaming notebook line. Our review system came packed with a Core i7-7700HQ processor, a GeForce GTX 1070 graphics card, 32GB of DDR4/2400 RAM, a 256GB M.2 NVMe drive, and a 1TB 7,200rpm SATA drive. The optical drive is again missing (and this time, there’s no USB optical drive included in the box), but who really needs an optical drive anymore? There are two display options: Our review unit has the 60Hz 4K IPS panel, but a 120Hz 1080p panel is also available (and given the 17.3-inch size, it might be a better choice for serious gamers). Both are G-Sync compatible. Our review unit also comes equipped with a wide-angle 1080p webcam with an array mic. Its low-light performance is only so-so, but it does have an IR sensor so it supports Windows Hello. Once you get used to split-second logins using only your face, it’s hard to go back. All this is powered by an 86 watt-hour battery, which lasted about 3 hours, 41 minutes in our battery rundown test (in which we calibrate the display to 250-260 nits and play a 4K video file in the TV and Movies app on endless repeat). That’s pretty decent battery life for a 17-inch gaming laptop, but of course you’ll drain it faster when playing games. Most gaming laptops are better described as “easily transportable all-in-one computers” rather than something truly meant to be used on the go, and this one is no exception. 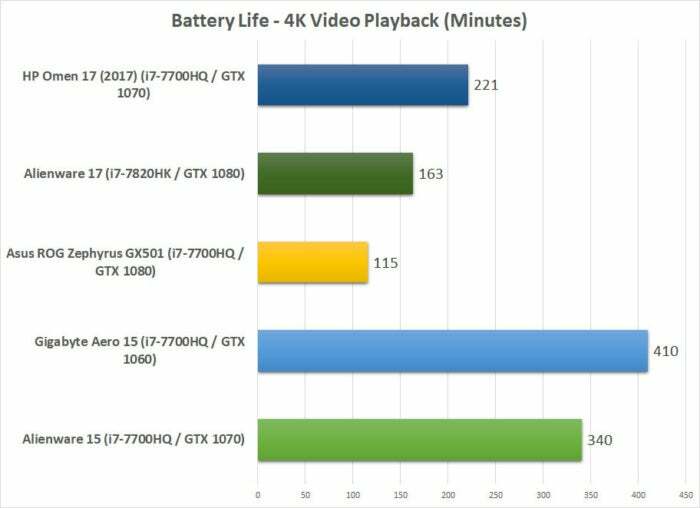 Our battery rundown test ran more than 3.5 hours, but it’ll drain faster while gaming. The price for all this hardware? Only $2,140 at this writing. Given the demands of 4K gaming and the minuscule size of the pixels on a 17-inch display, I think most gamers would be happier with the 120Hz 1080p version. If you take that display option, and reduce the RAM from 32GB to 16GB, you have a very powerful gaming laptop for $1,690. Any way you cut it, HP’s giving you a lot of horsepower for your dollar. 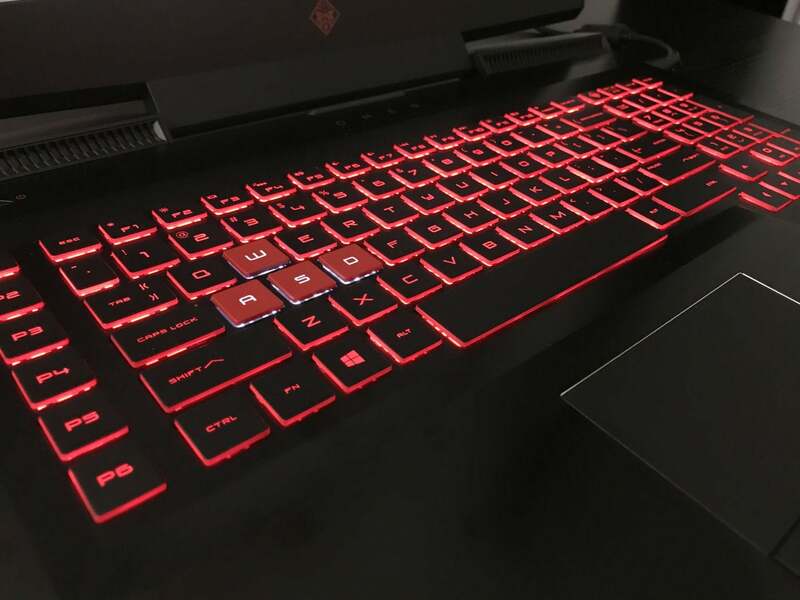 Of course, game performance is the number-one concern of those buying a gaming laptop, and the new HP Omen doesn’t disappoint, performs right in line with what you’d expect from these specs. Let’s take a look at the performance in 3DMark’s strenuous Fire Strike Extreme test. 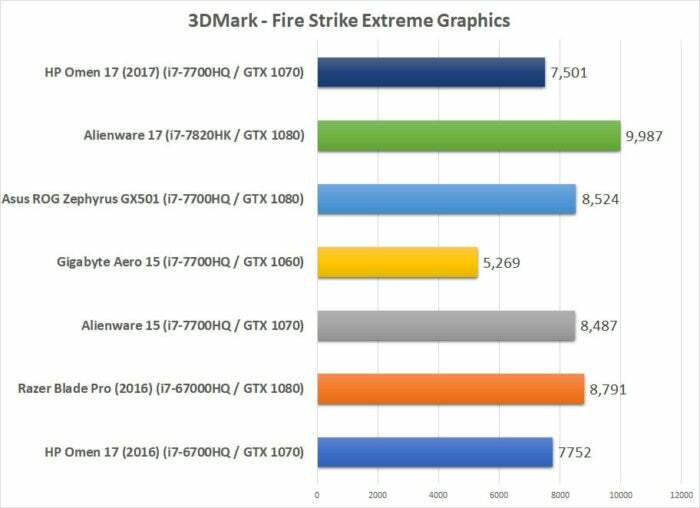 The graphics scores are right where we expect a GTX 1070 to be, and just a touch beneath last year’s model. This is exactly what we expect from a GTX 1070 in a gaming laptop. It’s noticeably behind the GTX 1080, but well ahead of the GTX 1060. 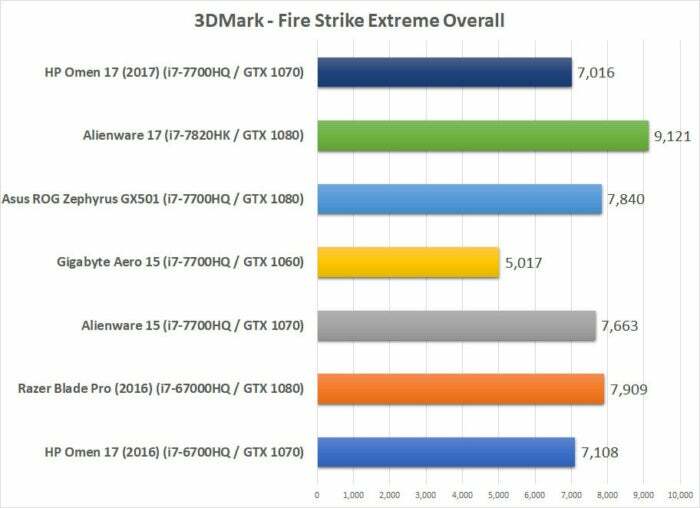 Note that the GTX 1070-equipped HP Omen from last year is just a touch faster, about 3 percent, which is right around the margin of error. 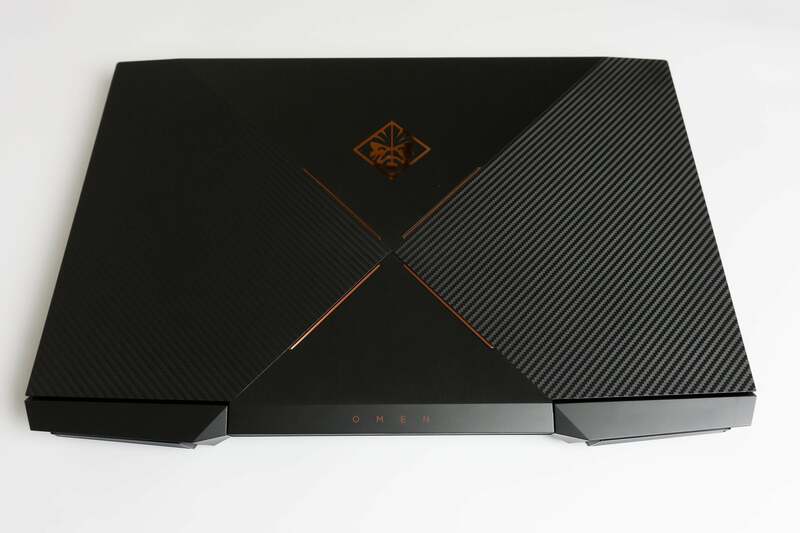 The new HP Omen performs about as well as the similarly-specc’d model from last year. That gap closes when we look at the overall Fire Strike score, which is right in line (just over a one-percent difference). For some reason, the 15-inch Alienware with the same CPU and graphics chip performs a bit better in Fire Strike, but that could be due to cooling or clock speeds—just because it’s got the same GPU doesn’t mean the manufacturer runs it at the same boost and turbo speeds, or has the cooling to keep those clocks up high during benchmarking. At a resolution of 1080p, this thing cranks out over 100 fps in Rise of the Tomb Raider. Unlike the synthetic 3DMark test, this real game test does show the expected minor improvement in performance from the ever-so-slightly faster CPU and RAM. 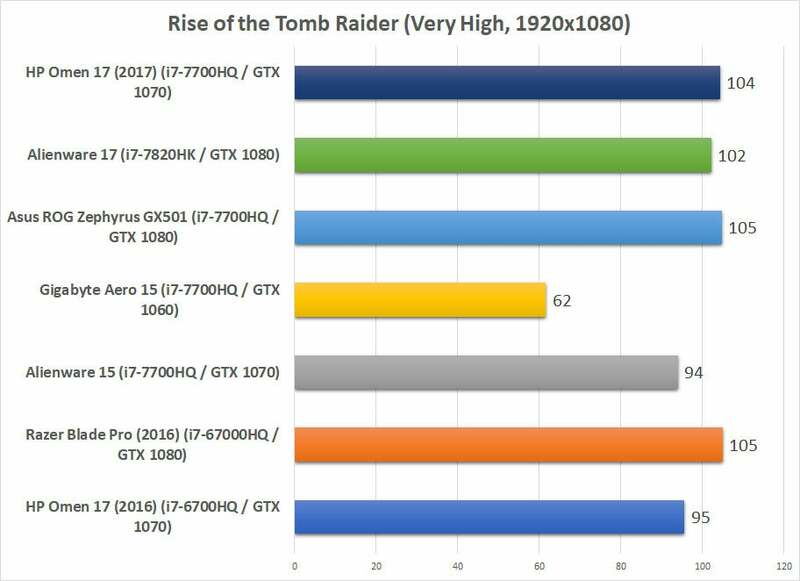 Over 100 fps at 1080p in Rise of the Tomb Raider. Not too shabby! This is also a good example of why the 120Hz, 1080p display option may be the better choice. With G-Sync, you get all the benefit of running at these high frame rates. When I cranked the game up to 3840x2160, however, performance dropped to 37 fps. With a display this size, high frame rate is going to do more for you than those extra pixels. 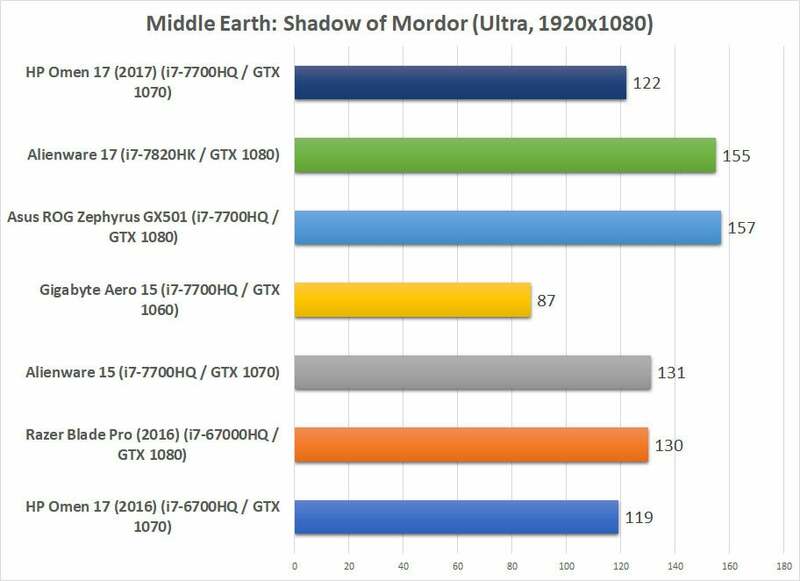 When we crank the delightful Shadow of Mordor up to its max settings and run at 1080p, we’re able to achieve average frame rates in excess of 120 fps. Again, it’s just a tiny bit faster than last year’s model, but not so you’d notice. This system just crushes it at 1080p gaming. At 4K, we’re back down under 60 fps again. Specifically, the average frame rate is 47 fps. That’s not bad at all. In fact, it’s quite impressive for a notebook. But that’s the average, not minimum. I know I’d rather run at 1080p with a much higher frame rate! What about non-gaming? 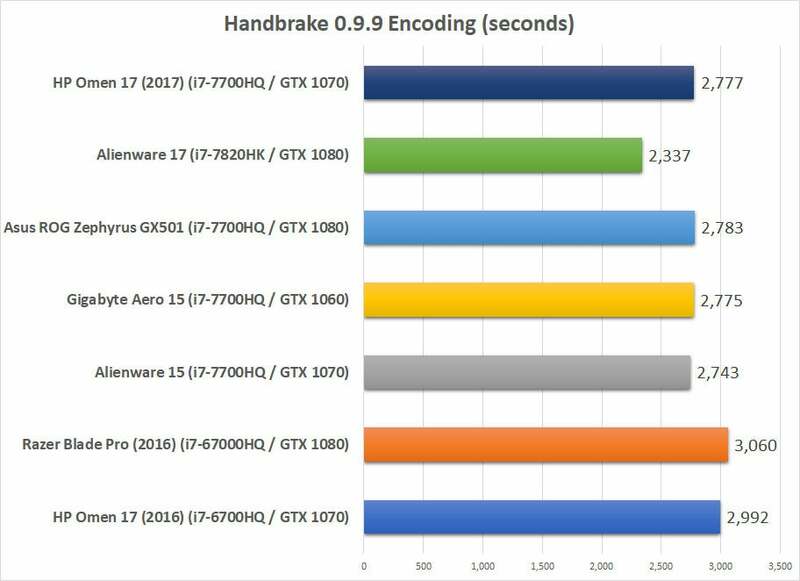 A quick look at Handbrake video encoding shows us what we expect to see from a Core i7-7700HQ and 32GB of DDR4-2400 RAM. HP’s system matches other 7700HQ-based laptops, and is just a tad faster than the Core i7-6700HQ found in last year’s model. Most people don’t buy a gaming laptop to do video transcoding, but it’s nice to know the performance is there to edit that video for YouTube if you want to. If you really need to do some video editing, this quad-core laptop can certainly get the job done. If you want to do office work and web browsing, well, this is overkill. Sweet, sweet overkill. The 2017 version of the HP Omen 17-inch gaming laptop is a small but welcome update from last year’s model. It still has some room to grow, with “just okay” audio and a “just okay” touchpad, along with a rather pedestrian aesthetic. But at least it’s not nearly as plain-looking as last year’s boring black slab, and some of the annoyances, like the lack of Thunderbolt 3, have been corrected. The newer Intel processors come standard, but those don’t really make a huge difference in performance. When we look at the big picture, we see a laptop that shares the same competitive qualities as last year’s model, despite the new design. It’s good-looking enough, feature-rich enough, and fast enough to make you think twice about spending hundreds more for one of its competitors. HP offers fantastic value here, if you can talk seriously about “value” in a high-end gaming laptop. The new 17-inch HP Omen gaming laptop isn’t a big departure from last year’s model, despite the redesign. We’ve seen faster and fancier gaming laptops, but it’s hard to beat HP’s aggressive price.